KWS-Room 14: successful tamariki in ruma waru!! successful tamariki in ruma waru!! Well I can't believe we are half way through term 1 already! The Easter break is in 3 weeks time, it was lovely to catch up with some of my class at Children's day activities in Kaikohe last Saturday. Nesta and Phoenix were having heaps of fun, the FREE sausages were delicious as well. This week we have been celebrating two amazing learners, Edward and Quiara-Lane. Edward was awarded a certificate for fantastic mat manners and for helping his friends be more focused in their learning. 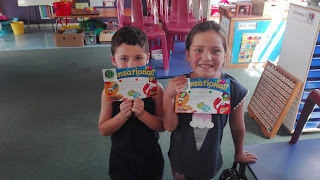 Quiara-Lane received a certificate for having a positively glowing attitude towards learning. She is a great asset to room 8 as she often finds extra jobs to do that help the teacher. We are still swimming Monday, Tuesday and Thursday!! Please encourage your tamariki to bring their togs as swimming as an essential part of the curriculum!! Thank you to all the amazing parents that have been supporting their children with their homework. Heaps of children are making amazing accelerated progress in their reading and spelling!! The school is having a whanau night on Thursday 12th April, more details to come!! Learning through play fun in room 8! !